Spain’s talented midfielders answered weeks of criticism over boring play with a masterclass performance of attacking football that led it to a second straight European Championship. Andres Iniesta, Xavi Hernandez, Cesc Fabregas and David Silva repaid coach Vicente del Bosque's trust in fielding a starting lineup without a traditional striker by pulling the strings in yesterday's 4-0 victory over Italy. After lifting the Euro 2012 trophy to make history as the skipper of the first team to win three consecutive major finals, Spain goalkeeper Iker Casillas said the last four years had been a 'wonderful' journey. ‘The Greatest’ Muhammad Ali once said he “floats like a butterfly and stings like a bee” and now he seems to have found a worthy successor, although not in the ring. Ali was astonishingly light on his feet for a heavyweight, while his footwork and movement was grace itself. And yet his wicked hand speed ensured he also had a knock-out punch capable of felling even the mighty George Foreman. Spanish midfielder Andres Iniesta was named player of the tournament. Jordi Alba came into the European Championship as the only player in Spain's 23-man squad without a single trophy to his name but now the marauding left-back has surely won the first of many. Italy captain Gianluigi Buffon spoke of his disappointment at having missed out on the Euro 2012 title but said he could only congratulate winners Spain. The world champions were a cut above yesterday and romped to a 4-0 thrashing that was accentuated by Italy playing the last half hour a man down after Thiago Motta limped off once coach Cesare Prandelli had already exhausted his substitutions. Decked in red and yellow, Spanish fans burst into chants of "Champions! ", detonated bangers and danced in fountains as a historic Euro 2012 win swept away the clouds of crisis. Young and old revelled in their unprecedented third straight international title, blaring car horns and flying the national flag in their hands, through cars and off the back of motorbikes yesterday. Maria Sharapova's hopes of winning a second Wimbledon title were shattered on Monday as the world number one was comprehensively beaten 6-4, 6-3 by Germany's Sabine Lisicki in the fourth round. Who will lead the Indian Olympics contingent, bearing the national flag, at the Olympic Games opening ceremony on July 27? Abhinav Bindra, India’s sole gold medallist at the 2008 Beijing Olympics, would be the logical choice but it’s likely that another Beijing medallist, wrestler Sushil Kumar, would get this honour. OMAHA: Michael Phelps finished off his preparations for his Olympic swan song in emphatic style on Sunday when he qualified for a fifth individual event on the penultimate night of competition at the US Trials. The four players were involved in nearly all four goals as Spain's quick-touch passing and slick combinations - termed “tiki taka” back home - helped the world champions win their third straight major title. “Even without a traditional striker they still cause a hell of a lot of problems,” Italy coach Cesare Prandelli said from the Olympic Stadium. Del Bosque aligned the same starting 11 that he used in the opening 1-1 Group C draw against Italy, and despite routing Ireland 4-0 and beating Croatia 1-0, scrutiny followed. The world champions then beat France 2-0 and Portugal in a semifinal shootout, but the murmurs continued. The term tiki taka has followed Spain since its Euro 2008 triumph in Vienna four years ago and Spain used its attractive passing game to keep the ball and phase their opponents out of the game. "What we do is difficult, but we make it look easy. It wasn't a walk in the park," Spain captain Iker Casillas said. "We knew that when you slip just a little but, people are there to criticize you. Now we have to enjoy this moment that will last a lifetime." On the first goal, Xavi gathered at midfield and fed Iniesta on the run, with the Spain playmaker threading a ball to Fabregas. But instead of taking a shot, Fabregas carried his run deep to the goal line before crossing back for Silva to head home. Xavi, who admitted he hadn't been at his best in Poland and Ukraine, certainly rebounded against Italy as he put Jordi Alba clear on goal with a perfect through ball in the 41st, and the left back scored his first goal with a low shot to the left. "We deserved it, we were superior," Xavi said. "We played a complete game and perhaps the best of the entire European Championship. We made history and now we have to enjoy it." Spain completed 815 passes to take its overall total in the tournament to more than 4,200. When Italy was reduced to 10 men following the injury of Thiago Motta in the 64th with no substitutes available, the Azzurri had no chance as Spain controlled through its passing with substitutes Fernando Torres and Juan Mata adding late goals. Del Bosque started with Fabregas, who usually plays an attacking midfield role for Barcelona. He led Spain's attack three times at the tournament. While Torres' late goal ensured he was the tournament's top scorer, it was with Fabregas as a roving center forward that Spain played with the most confidence. After lifting the Euro 2012 trophy to make history as the skipper of the first team to win three consecutive major finals, Spain goalkeeper Iker Casillas said the last four years had been a 'wonderful' journey. The 31-year-old Real Madrid shot stopper was on hand to keep out the relatively little that Italy managed to throw at him as La Furia Roja ran out 4-0 victors for the biggest winning margin in the tournament's history, allowing Spain to become the first nation to retain the trophy. With yesterday's win sandwiching the 2010 World Cup, Casillas was ecstatic afterwards. "This is such a truly wonderful moment. The second goal from Jordi (Alba) clinched it really," he told Telecinco television. "It's been four marvellous years. You might think that a 4-0 margin against Italy means it was easy - but we have been gradually stepping up as the tournament went along." There had been criticism of Spain and their coach Vicente del Bosque for playing much of the tournament without a true striker and again it fell to Cesc Fabregas to adopt the 'false nine' role in the final, until Fernando Torres came on to net the third and then set up the fourth for fellow substitute Juan Mata. But Del Bosque refused to listen to the critics and here Spain answered them most emphatically. "There will always be some criticism as we have set the bar so high that that's what happens when you come down a pip," Casillas explained. And now in the form of Andres Iniesta there is a footballer whose own skills and prowess seem a match for the Louisville Lip. Although slight of frame and quiet of temperament, Iniesta is a different proposition once his boots are laced up. With a feint here or a shimmy there he creates half a yard of space even when surrounded by two or three opponents. And then with a burst of acceleration he darts through a gap and into the space between midfield and defence, sending panicked centre-halves into an awkward back-peddle as his eyes dance around in search of a supporting red shirt. With the precision, accuracy and venom of an Ali punch he fires a perfectly weighted pass into his supporting runner's path as the opponents' defence parts like the Red Sea. In fact, it was a sea of red shirts that overwhelmed Italy in the Euro 2012 final here on Sunday. Small, nippy but technically perfect Spaniards zipped passes around as the otherwise talented Italians failed to get a foothold in the game. Iniesta was the tormentor in chief, ably aided by his fellow architect Xavi as the pair fed the likes of willing runners Cesc Fabregas and David Silva, not to mention the gallopping full-back Jordi Alba. "For me, it's not that important to score goals," he said modestly afterwards. It's not the most important thing." "It's always been like this for me. I'm very happy we're the champions again. It doesn't matter who scores the goals. It's not even important if you win the Ballon d'Or. I just want to enjoy what I'm doing and if people appreciate that, then I'm happy," Iniesta said. Iniesta was the man-of-the-match, but after a low-key showing in the semi-final against Portugal Xavi was back to his normal self and ran him close this time. Each one was at his most immeasurably majestic in the first half when Spain opened up an unassailable 2-0 lead. Iniesta it was who carved up the Italian defence for Silva's 14th-minute opener, delaying his pass to perfection to put Fabregas in behind Giorgio Chiellini, before the makeshift forward fired a cross at Silva's head. The diminutive Manchester City winger reacted just quickly enough to direct the ball under the bar. Almost as if he felt motivated by the challenge laid down by his club and international colleague, on 41 minutes Xavi produced an even better pass, delayed it even longer and weighted it even more perfectly for Alba to streak beyond the ponderous Italy backline and beat Gianluigi Buffon with consummate ease. In fact, Spain as a whole seemed to be driven by defiant conviction and late efforts from Fernando Torres and Juan Mata further underlined their superiority. Stung by accusations of waning powers and a boring style they were a team on a mission. The 23-year-old only became a first team regular at this tournament, with six of his 11 caps coming during the last month in Poland and Ukraine climaxing with a super goal in the 4-0 thumping of Italy in the final here yesterday. "These Euros have been an incredible dream come true for me. It was my first Euros - the other guys had already been making history" with their successes at the last World Cup and at Euro 2008. "Now it's my turn and I can do the same alongside them. I still can't believe it - it will sink in eventually," said Alba, who last week finalised a 14 million euros move to Barcelona. I've got to be really happy given what's happened to me in the past few days," Alba grinned. Having played only once in the qualification campaign, Alba has now made the Spanish left-back slot his property. And to see him streaking down the line, head back, arms pumping in full gallop, it is easy to see why. By then Italy were already two goals down and reduced to virtual spectators, according to midfielder Daniele De Rossi. 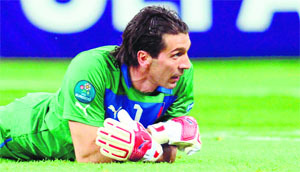 But for Buffon there was no shame in losing to the best. "For many of our squad it was their first final so that's why it's a huge disappointment," he said. "But it's also true that in such an important match when there's the substantial difference that you saw, all you can do is clap your hands and applaud the others." Buffon said he could only think of one other occasion when he had played in a side so totally dominated: a 3-0 Confederations Cup group stage defeat to Brazil in 2009. "I had a great view of the red waves from the first minute to the last," said the goalkeeper of Spain's performance. They played with great knowledge of being strong and of what they wanted and knowing that they had already won a lot so they knew how to achieve this type of result. And against a team (Italy) that physically was in the red. Sabine Lisicki celebrates after beating Maria Sharapova. In other matches, Roger Federer shook off a back injury to beat Xavier Malisse 7-6, 6-1, 4-6, 6-3 to reach the quarterfinals, Serena Williams fought hard to beat Yaroslava Shvedova 6-1, 2-6, 7-5, and Belgium’s Kim Clijsters was knocked out. Lisicki, the world number 15, had top seed Sharapova on the back foot early in the first set, forcing her into a string of uncharacteristic errors, and did not let up until she had gained revenge for her semifinal defeat by the Russian last year. Bindra was indeed the IOA’s choice to be the flag-bearer but his event is scheduled for July 30, just three days after the opening ceremony. Carrying the flag for a long time during a tiring, distracting opening ceremony isn’t ideal, and the IOA doesn’t want to take a chance. Beijing bronze medallist boxer Vijender Singh might have a bout to fight on July 28, so he also may be out. The third Beijing medallist, Sushil, is scheduled to be training in Belarus during the opening ceremony and is expected to reach London on August 3. But the IOA may fly him to London specially to be the flag-bearer. 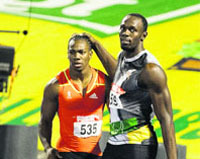 An IOA official told the Tribune that this is the most likely scenario. But if all these names are dropped for various reasons, Leander Paes could carry India’s flag at the ceremony, like he did at the Sydney Olympics in 2000.